Clearly, Jesus did not appoint a Pope and the scriptures do not appear to allude to such an office. It would seem that the title of Pope was not in use until the 6th century. However, the power of the Bishop of Rome began to steadily increasing and between 440-461CE, when Leo I saved Rome from attacks from both Attila the Hun and Genseric the Vandal. Subsequently, he was able to increase the power of the Roman bishops over the bishops of other provences in Western Europe. However, one of the greatest leaders of the Catholic Church was Gregory I, also called Gregory the Great; who held office from 540-604CE. Although Gregory never called himself Pope, he introduced the changes that were to lead to the foundation of the Papal system. By 800CE, Pope Leo III crowned Charlemagne as `Emperor of the Romans` and this marked the beginning of what was to become known as the Holy Roman Empire. The intention was to create an alliance between the Church and the State. 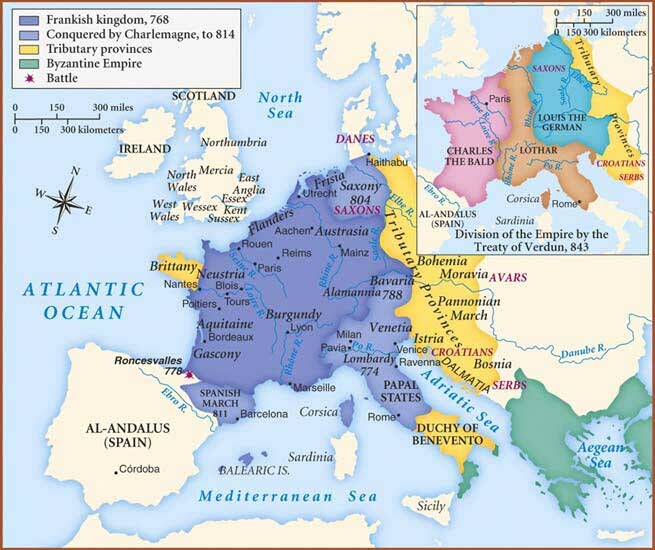 Under Charlemagne, the empire included most of Europe and initially the emperor had considerable influence over the Church. For example, Charlemagne insisted that the Church set up schools and imposed laws concerning the action of its priests. However, after the death of Charlemagne, the alliance was to degenerate into a power struggle between subsequent Popes and Emperors. At the same time, Muslim pirates were beginning to terrorize the Mediterranean, while Vikings were likewise terrorizing in the northwest and the Slavs, Bulgars and Magyars attacked in the east. During the Papal reign of John VIII between 872-882, the Pope was forced to raise a naval force to defend Christendom from the Muslim incursions, but was eventually forced to pay them an annual tribute. As a consequence, the papacy grew weak and rich families were able to buy their way into the papal system. In a 20-year period there were twelve popes, with Pope Benedict IX being only 12 years old, when he ascended to the papal throne. Surprisingly, despite this lack of spiritual leadership, the Church continued to expand. For example, Moravia, Bohemia, Poland and Hungary all became Christian countries during this period. Norway turned to Christianity and, in turn, evangelized Iceland, Greenland and Sweden. In the meantime, the Eastern Church brought the Christian faith to Bulgaria and Russia. Equally, as the power of the Emperor waned, the Pope's influence on individual kings and princes grew stronger. If a ruler did not obey the Pope, then excommunication could be brought to bear, which could ultimately lead to an entire population being denied the services of the Church. This was usually enough to persuade the people to bring pressure on their rulers, thereby effectively underwriting the power and influence of the Pope. However, there were also major conflicts in the views of the Eastern and Western Churches. The first, known as the Iconoclastic Controversy in 726, arose when the Eastern Emperor attempted to ban the use of statues and pictures in worship, reacting to the Muslim claim that such things were idols and that the Church was polytheistic. Although, the Western Church rejected the iconoclastic movement, the Eastern Church compromised by allowing only pictures. Another conflict is known as the Filioque Controversy. The original creed had stated that the Holy Spirit `proceeds from the Father`. The Roman Church had changed this to `proceeds from the Father and the Son`. This was seen by many as a major alteration to the creed, which had not been agreed by the Church as a whole. Other disagreements eventually accumulated and finally in 1054, the Western/Roman Church and the Eastern/Byzantine Church separated, each effectively excommunicating the other. The Western Church calling itself the `Catholic Church`, while the Eastern Church became known as the `Orthodox Church`. The word `Pope` is derived from the word `papa`, which means `Father`. According to Christian doctrine, Jesus is said to warned his followers `do not call anyone on earth father, for you have but one Father, and he is in heaven`. So when and why did the Roman Catholic Church start appointing Popes?